Here we are at last—the big day. We’ve looked at sectioning citrus, and zesting citrus, and making luscious citrus syrup. Now, finally, we’re ready to candy all those peels that we’ve saved (well, not the ones that we zested, but stick around and I’ll even show you a bonus way to use those—tomorrow). 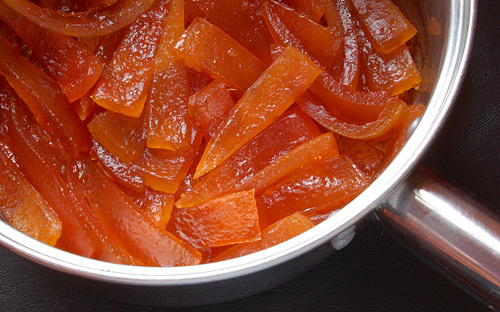 Candied citrus peels are one of my favorite holiday confections (and quite popular among my list of recipients). There are a lot of steps involved, but as candy making goes, they’re relatively easy—you don’t even need a candy thermometer. I use the recipe found in The Fannie Farmer Cookbook, with only very minor alteration. The hardest part is saving enough to give as gifts! For candying, you want to try to choose fruits (three oranges or two grapefruit—I usually do one batch of each) with unblemished skins and good color. Scrub the skins thoroughly before cutting. Cut each fruit in half through the middle, and use the pulp and/or juice for any application you like. 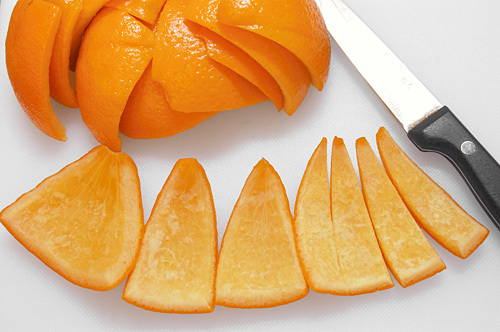 Quarter the halves of empty shell and peel away the pulp and pith to leave peels about 1/8 to 1/4 inch thick. Cover the peels with cold water, bring just to a boil and simmer for half an hour; drain and repeat. I simmer and drain orange peels thee times and grapefruit four (the original recipe just calls for twice, but I found the peels still had too much bitterness for my taste). As they cook and soften, the peels become quite tender and need to be handled carefully to keep from tearing them. Once drained for the last time, remove them to a cutting board, and cut them into strips (I quarter the wedges by cutting them in half, and half again—this yields pieces that are about 1/4 to 3/8 inch wide). Cut each wedge into four strips (half, and half again). Next, combine the sugar, corn syrup and water in a pan (you can use the same pan, but rinse it thoroughly to remove any bitter residues from cooking the peels). Bring to a simmer and stir until the sugar is all dissolved, then add the peels. You’ll need to gently shift the peels around to work them all in—try to get them mostly covered by the liquid to start. The peels don’t need constant attention while simmering, but keep a close eye on them—the heat needs to be reduced periodically as the liquid becomes absorbed and thickens. The peels won’t all stay covered as there is less and less liquid; just give them a periodic stir to coat, turning them over carefully to avoid damaging them. By the time the liquid is mostly gone, I’ve generally turned the heat all the way down to keep them just barely at a simmer. This process usually takes a couple hours, during which time I do other things and just check them from time to time. It’s a good idea to set a timer to remind yourself to check them every so often—after all this work, you really, really don’t want them to burn. When the liquid is nearly all used up, turn the heat off, cover them, and let them sit overnight. Grapefruit peels will generally be all translucent and even-toned by the end of the process; orange peels will retain lighter coloring in their pith. 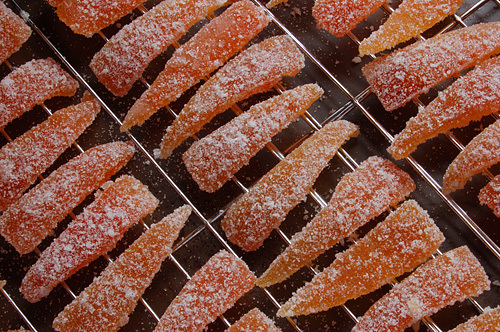 Grapefruit peels take on a translucent glow when candied. After the peels have set overnight, bring them briefly back to a simmer, then remove them from the heat. Fill a shallow bowl with a layer of sugar (I start with about a half an inch), and have a baking sheet with cooling racks standing by. 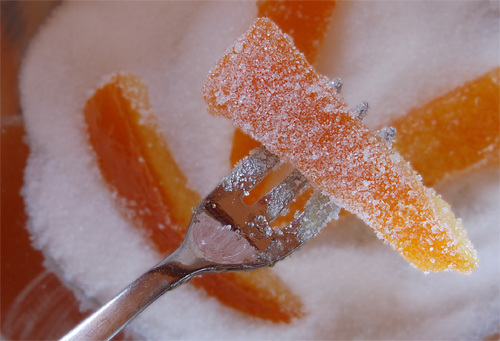 With a small fork, lift pieces out of the pan, letting any residual syrup drain off, and roll them in the sugar. I drop one in, flip it once, sliding it sideways to coat the sides, then lift it out on the fork, giving a tap or two on the side of the bowl with the tines of the fork to dislodge excess sugar. If this approach sounds tedious and off-putting, you can also put the whole works (drain them first, though) in a ziplock bag with about 3/4 cup of sugar and toss gently until coated. I found that the peels were less evenly coated this way than dipping them individually, and the sugar coating was thicker than I prefer. But they were still much better than no citrus peels at all! Spread the coated peels on racks to dry. I’ve found they need to sit at least overnight before being closed up. One of the first mistakes I made in learning to make these was closing them up in storage containers too soon—they made a sticky, melted mess. Sufficient drying is important to the candy's final consistency. Once the peels are dry enough to handle easily, they can be stored in an air tight container, or packaged for gifts. They keep quite well—except for their tendency to disappear quickly! Thoroughly scrub the fruit before cutting it up. Cut each piece in half width-wise (halfway between the stem- and blossom-ends). Remove the fruit and/or juice and use for another application. Take each empty half-shell and quarter it; remove any remaining pulp along with enough of the pith to leave skins between 1/8 and 1/4 inch thick. 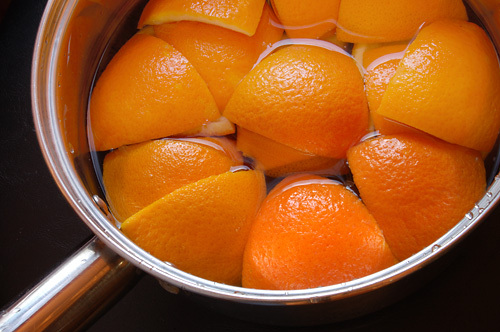 Place the peels in a medium saucepan and cover with cold water; bring to a boil, reduce heat and simmer for 30 minutes. Drain, cover with cold water and simmer for another 30 minutes. Repeat this process once more for oranges; twice more for grapefruit. (For oranges, this should be done three times in all; grapefruit four.) The peels should be quite tender at this point and need to be handled carefully to avoid tearing them. Drain the peels once more, remove them from the pan, and cut them into strips of about 1/4 inch width. Combine 1 cup of sugar with the corn syrup and water; stir over low heat until all the sugar is dissolved. Add the peels, bring to a very low simmer, and cook until nearly all the syrup has been absorbed. Cover and let stand overnight. Before coating, bring the peels to a simmer again, then remove from the heat and drain. Fill a shallow bowl with about a half inch of sugar. Use a fork to lift each peel out of the pan and roll it in the sugar; place coated pieces on a rack to dry. Alternatively, put all the peels in a gallon storage bag with about 3/4 cup sugar. Toss gently until all the pieces are coated. Let the coated peels sit out to dry overnight, or until they are no longer sticky to handle, then store in an airtight container. 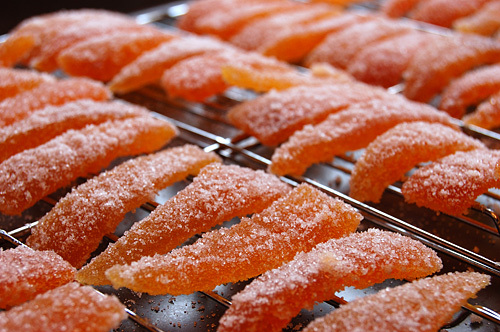 Makes about 64 grapefruit or 96 orange candies.